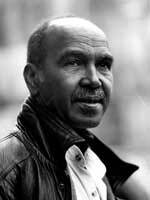 Nuruddin Farah (b. 1945) was born in the Italian-ruled southern region of Somalia, Baidoa. His mother was a traditional storyteller, and his father was a merchant who later worked for the British government as an interpreter. Farah lived in a multilingual environment and learned to speak Somali, Amharic, English, Italian, and Arabic. When he began to write, Farah chose English as the language of his works. His first novel, From A Crooked Rib (1970), depicts the authoritarian role of patriarchy in African society and earned Farah praise as a "male feminist." The publication of his second novel, A Naked Needle (1976), angered the Somalian dictatorial regime and finally forced Farah into exile after receiving death threats. Farah would not return to live in Somalia again, but his lifelong pursuit is to keep his country through his writing. Farah has written over ten novels, numerous essays, and several plays. His novels include the titles Sweet and Sour Milk (1979), Sardines (1981), Maps (1986), and Secrets (1998). His essay titles include "The Creative Write and the Politician" (Classic, 1984), "Why I Write" (Third World Quarterly, 1998), "A Country in Exile" (Transition No. 57, 1992), and "False Accounting" (Granta No. 49, 1994).